FRIDAY, Jan. 26, 2018 (HealthDay News) -- Older women who carry some extra body fat may face a heightened risk of breast cancer -- even if their weight is normal, a new study finds. "This suggests women should not just concentrate on weight," said Mia Gaudet, strategic director of breast and gynecologic cancer research for the American Cancer Society. "Instead, they should focus on doing things that can help reduce body fat levels -- like a healthy diet and regular exercise," said Gaudet, who was not involved in the study. Past research has found that overweight and obese women generally have a higher risk of developing breast cancer after menopause. But doctors have long relied on body mass index (BMI) to tell whether people are normal weight or not. The problem is, BMI does not distinguish between fat, muscle and bone. So, it's an imprecise gauge of body composition -- and disease risks, recent studies have shown. It's now "fairly well established" that BMI is not the best indicator of a person's risk of conditions like type 2 diabetes and heart disease, said lead researcher Dr. Neil Iyengar. And now it seems that may also be true for breast cancer, said Iyengar, a medical oncologist at Memorial Sloan Kettering Cancer Center, in New York City. The findings are based on 3,460 women aged 50 to 79 who were part of a large study called the Women's Health Initiative. The women all had a normal BMI at the outset, and all had their body fat measured with dual energy X-ray absorptiometry, or DXA. DXA is a whole-body scan that gives a snapshot of a person's body composition. Over 16 years, 182 women developed breast cancer; most had tumors that were estrogen receptor-positive -- which means estrogen helps fuel their growth. On average, the study found, women with higher body fat levels had a greater risk of developing ER-positive breast cancer: Women whose fat levels were in the top 25 percent were twice as likely to develop the cancer, compared to women in the bottom 25 percent. The findings do not prove definitively that body fat caused the cancers, according to Iyengar. But his team accounted for many other factors -- including the women's family history of breast cancer, use of hormone therapy, and their exercise and drinking habits. And still, extra body fat was a risk factor. Why would body fat matter? Fat is "active tissue," Iyengar explained, and when it accumulates in excess, it outgrows its blood supply and fat cells start to die. When that happens, he said, there is inflammation, and substances called growth factors are churned out. "Those growth factors can potentially support cancers," Iyengar said. On top of that, fat is a source of continued estrogen production in postmenopausal women, said Dr. Graham Colditz, of the Siteman Cancer Center at Barnes-Jewish Hospital, in St. Louis. Colditz, who was not involved in the study, said the findings make sense. But practically speaking, he added, it will still be much easier for women to monitor their weight on the bathroom scale, versus having their body fat levels tracked. Colditz echoed Gaudet's advice: Even if women have a normal BMI, they should still strive for a healthy diet and regular exercise -- including, he said, resistance exercises to maintain and build muscle. In fact, Iyengar said, study participants with higher body fat levels did generally exercise less often than other women did. The study looked only at postmenopausal women, so the findings do not necessarily apply to breast cancer in younger women, Iyengar said. 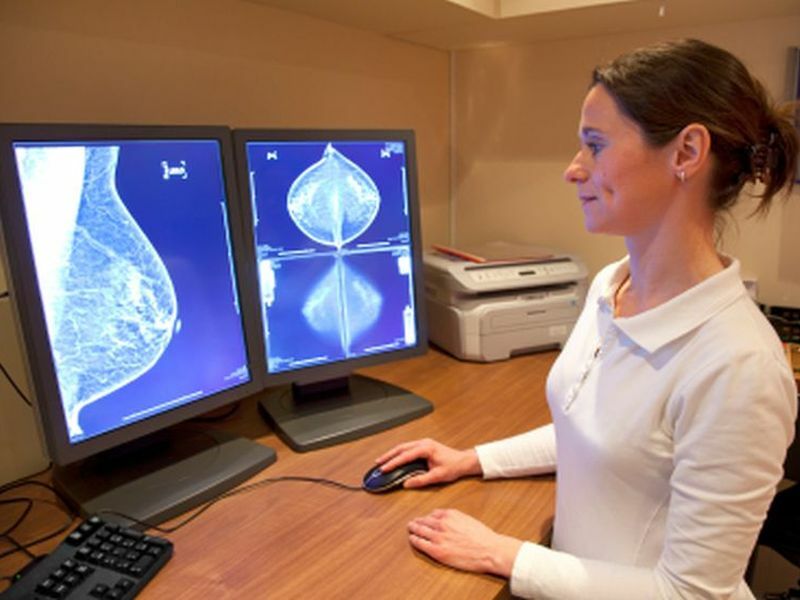 In general, he noted, premenopausal breast cancer differs from cases that arise later in life -- and it's not clear whether weight or body composition have any bearing on that risk. The findings were to be presented Friday at an American Association for Cancer Research conference in Austin, Texas. Such research is considered preliminary until published in a peer-reviewed journal.